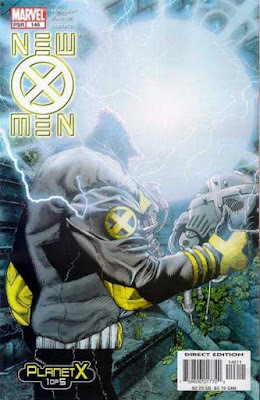 "Can you believe Xorn was Magneto?!?" My chin hit my chest, and the dude instantly realized what he had done. He ruined the plot twist that the part two years of X-Men stories was leading up to... and he didn't just ruin it for me, there were other people in the shop as well. He rang up my books, and I stopped him before he scanned New X-Men #146. He looked at me funny, and I just shook my head "no". Rather than argue, he gave it to me for free... I mean, the entire thing was ruined, it was the least he could do. So yeah... I really don't like spoilers. I said all of that so that I may say this. This final issue of Vigilante will be irreparably spoiled for you should you choose to continue. Granted this is a nearly thirty-year-old book, but I want to make it perfectly clear that I am about to ruin the (fairly shocking) ending in this here post. Still with us? Okey dokey... let's do this. Adrian Chase picks up the latest edition of the local newspaper. The headline states that someone called the Homeless Avenger has been killed. The Homeless Avenger, like Chase, was a Vigilante. It is alluded to that Chase left the Avenger to die in something of a riot the night prior. This is just the beginning of Chase's realization of all the harm he has inflicted on those around him. In order to perhaps justify his actions to himself, Chase thinks back to why he started on this path. Why he became the Vigilante. He was a District Attorney in Manhattan who had a hit put out on him... however, it would be Chase's family that paid the ultimate price. Enter, Chase's on-again-off-again, Black Thorn. She's sporting a black eye (courtesy of Chase... see, he's having a pretty rotten time of late). They discuss the recent events concerning the Homeless Avenger. Thorn wishes to speak about what happened between them the night before as well, however, Chase ain't having it. She tries to keep him there, to which Chase smacks her across her face and knocks her down. A man exits the building. The police have been staking out the place overnight. Captain Arthur Hall instructs his men to chase the fella down. The pursuit continues through several blocks, several buildings, and over several fences. They finally catch up with who they believe to be Adrian Chase... however, they got the wrong guy. Probably still a bad guy, given the frantic escape attempt... but not their target. Adrian Chase decides to take in a wholesome slasher movie to get his mind off of things. There are some punk kids harassing an elderly fellow a few rows back. Chase tries to maintain his cool, however, completely flips out and thrashes the little bastards. As he pounds away, he comes to the terrifying realization that he no longer has any control over his Vigilante instincts. He flees the theater as security approaches. Black Thorn meets up with Detective Harry Stein at a diner to discuss what's going on with Adrian. She fears his mental capacities are failing, and he just may be losing his mind. Stein, understanding chap that he is tells her to chill out. Chase, now in his Vigilante gear, raids an opium den... which becomes an incredibly violent and shooty affair. The nearby police along with Hall receive word of the raid, and head over. While Vigilante shoots anything that moves, he carries on an internal monologue recounting several others who wore his Vigilante costume and met with a fatal end... one by his own hand. Before he knows it, Chase has killed dozens of men inside the opium den. Surrounded by piles of fresh corpses, he thinks to himself how everyone in his presence winds up dead. He collapses forward, and vomits. The Police burst through the door, and Chase throws himself out a window. Outside, after a brief period of rest and further reflection, Chase reenters the fray. What appears to be a shootout between the police and some thugs was ultimately a trap to lure the Vigilante in. No sooner does he enter, that all the guns turn to point at him. What is a Vigilante to do? He fires back. Now, Adrian Chase is a cop-killer. Attempting to flee before he can commit any more atrocities Chase is approached from behind. He turns and instinctively fires... and realizes that he just shot Captain Hall dead. They exchange a few, pretty contentious words as Hall lay dying. As the rest of the officers approach, Chase flees once more. The next scene... is the big one. We observe Chase in his apartment. He's holding a pistol, and he carefully inserts one bullet into the chamber. He lifts his Vigilante mask and crushes it in his hand as he enters the bathroom. He considers the significance of what he is about to do, and after a few moments of hesitation proceeds to place the pistol under his chin, and somewhat reluctantly... pulls the trigger. Black Thorn enters moments later and discovers what had just occurred. The issue and series ends with the very small funeral service of Adrian Chase. Adrian was cremated, and Thorn keeps his urn of ashes. Now that was a damn fine way to close out a series. I'd read this issue a few times before today's review, and each time I still get the butterflies as I work my way through it. The moment after he shoots Hall... you know that he's taken that one step too far, and there would be no coming back. In the hours leading up to the event in question, he recounts all of the lives he'd left in his wake in the name of his twisted form of justice. He was initially put on his path due to the death of his wife and children... not unlike another certain skull-chested vigilante. 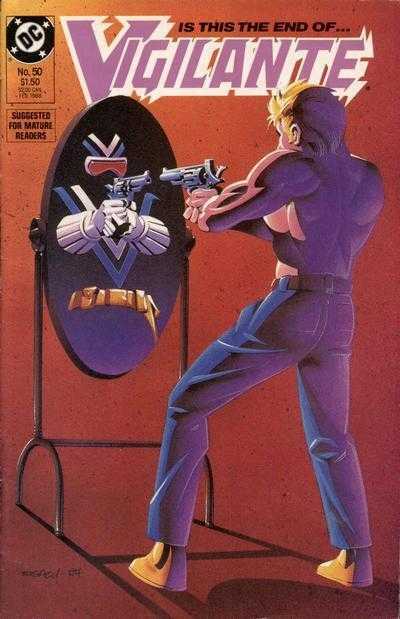 However, unlike the Punisher, Chase's motive was more justice than revenge. I believe he somehow justified his actions, almost making it though they were for the overall good... the Punisher, I feel knows what he's doing is wrong... and he just gets over it. You get the feeling that the Punisher doesn't really take inventory of his actions. Never stopping to consider what he was doing. Adrian Chase, however, continuously beat himself up over what he'd caused to occur. When that overwhelming guilt... almost tangible... the physical heft of that guilt, was just too much for him to bear... well, he needed both a way out, and a way to pay for his sins. Suicide is something that should not be taken lightly. Kupperberg does an amazing job showing Chase actually hesitate. He's sitting in his bathroom with that pistol... and he... stops. He sits down. He thinks. He realizes the irrevocable nature of what he is about to do. A lot of credit needs to be given to artist, Steve Erwin as well. He gives us, in Chase's facial expressions (and even posture and visible mannerisms) such conflicting emotion. Even to the final panel before killing himself, the detail of his finger trembling is included... up to the very last moment, Chase was struggling with his decision. A terrible and wonderful issue that I'm sure this piece did very little justice to. It is something that should be read... even though I've just ruined it. If you come across this issue, don't hesitate... pick it up. You can then hesitate with every turn of the page until Adrian Chase ultimately makes peace with and meets his (un)timely end. Thanks for the remembrance. I was a freshman in college when that last issue was published, a year after I first discovered the series. Reading it again now, and understanding the full weight of Chase's final decisions, is a much different experience than when I was 18. I can't say the revamped, more ruthless portrayal of the character so far shown on TV this season on "Arrow" has, pardon the pun, done the Vigilante justice. Adrian Chase did beat himself up quite a bit for his actions as Vigilante, especially after he regained his identity and people lost their lives. His mission got out of hand and in the end, he couldn't reconcile himself to that. "That costume brought its original owner nothing but pain, grief and ultimately his own destruction. I'd flush it down the nearest sewer if I were you." Thing is Captain Hall apparently survived because he continued to appear in various Titans titles for decades after this.